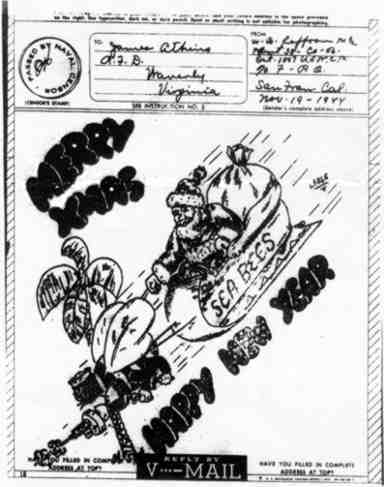 December 2006 Newsletter, Surry County, Virginia, Historical Society and Museums, Inc. Surry County Virginia Historical Society and Museums, Inc.
December 2006 Newsletter and Meeting Notice. The Monday, Dec. 11, 2006, meeting of the Society will be at 7:00 P.M. at the Surry County, Va. Recreation Center. Our speaker will be Judy Lyttle, member of the Surry Board of Supervisors. Judy has headed up Surry County's efforts with the 2007 celebration of the founding of Jamestown and serves on several committees. She will bring us up to date on plans now underway. May 2007 is coming fast, and Surry County must be ready. Don't miss this report on the exciting activities. My father died on Sunday, May 4, 1980. I can recall the phone call from my sister, Sheila, who was barely able to deliver the news. Recorded in a journal is the following account: She said, "Daddy passed about 2:00 p.m." Chills ran through my body, and I began to feel warm all over. I knew I needed to tell my sister, Deborah, who was also a student at the University of Virginia in Charlottesville. On the way to her dorm, feelings of anger were smoldering. I was surprised at myself for feeling angry about Daddy's death. Perhaps this was because of selfish reasons. Would I be able to remain in school? Or would I be able to continue living at a level or standard that I had become accustomed to, afforded me by my father's income? These concerns merely skimmed the surface of all that was happening to me during these moments. It was much later that I learned the real concern. Where do I stand, now that Daddy is gone, in a group of people whom I loved and respected and of whom I wanted desperately to remain a part? Where did I fit in the extended family now that my immediate link to the family was gone? Would family members feel the same way about me, my brothers and sisters, now that Daddy was gone? It was out of this experience of loss and grief that a lifelong hobby was developed. Perhaps more than a hobby - a therapy for grief. It became a remedy for reconnecting me to this family or group of people of whom I so desperately wanted to remain a part. Daddy was gone, but I still wanted to be a part of this extended family group. Six weeks after we buried Daddy, I found myself in the public documents section at Alderman Library at the University of Virginia. My first page of notes is dated 20 June 1990, on which I copied names of residents listed on the 1870 census for Surry County, Virginia. There it was, as clear as day, Patrick Harrison, my ancestor. Daddy's name was Melvin Gordon Harrison but almost everyone referred to him as "Pat." He had shared with me many times that he was called "Pat" because of the light color of his hair as a child, as did Patrick Harrison have as an adult. Daddy knew this day would come, for he would sit with me as a child and have me memorize and subsequently recite the birth dates of his parents, siblings, aunts, and uncles. This new quest seemed to give purpose to what Daddy shared with me as a child. He had left in place a vehicle to continue the connectivness that I now sought to keep in place. There remained a need to be part of a group of people who shared a common ancestry, values, religion, and community. It was this feeling of being a part of something, that is to say family, that provided for my growing into a well-adjusted and healthy individual and citizen. An interesting thought is that this is not a group that one having the opportunity to choose would probably select. These are at best ordinary people, not wealthy and rich or belonging to a powerful majority in society. These are a simple group of former slaves, farming freedmen, and hired servants, primarily of African descent moving up and down a twenty-mile stretch of land along the southern banks of the James River in Surry County, Virginia. They had gone up and down this river for more than two hundred years, working the lands of Eastover, Floods, and Pipsico Plantations, to name a few. I am one of them! I am from somewhere. I can identify with these people, the land, the river, and the names. This sense of belonging has led to the development of a sense of security. Now it is this sense of belonging to the group - family - that has made it possible and easy to accept their way of life. It is all that one knows. We can only do what we know. So I take on the values of previous generations and I want in a desperate way to transfer them to my son and daughters, and all subsequent sons and daughters. What I have not realized before is that this quest, this desire to be connected, is deeply spiritual. It was during this experience of grief that I began to turn inward and intensify my search and need to have a deeper spiritual experience. Genealogical research is a spiritual responsibility. Rummaging through census records, county court records and ledger books has given me that sense of connectedness that I longed for over the past 26 years. I would recommend to any young person to develop interest now in genealogical research. Start with parents and grandparents, reviewing family bibles and attending family events. It has helped me to adjust to many of life's changes. On very personal level, a permanent place to house the works of the Historical Society, and having the accessibility to research court records are so very important not only to me but every other citizen in the county who seeks to be connected to and identifying our place in Surry's history. 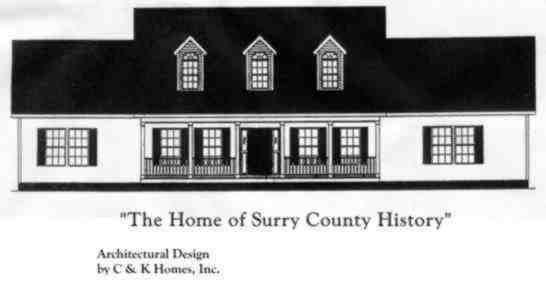 Thank you for your support of the Society's effort to construct a building in the Town of Surry. We have currently generated over $95,000 in pledges and monetary gifts. We sincerely hope to meet the $100,000 challenge gift by December 16, 2006. We still need your support! Let's start the season with a Christmas card from our past. This Christmas Card came to me from my Uncle Wallace Laffoon in Nov. 1944. He was in the Seabees, the construction arm of the Navy, on some unknown island in the Pacific. To provide a way to correspond with the many thousand troops overseas, V-Mail was established. Both our troops overseas, and their families back home had a one page form on which they could write letters. No postage was required when sent by our military, but regular postage was required by others. These V-Mails were censored and photographed, and the film taken to their destination. Thousands of letters would take-up little space, and were printed at their destination at approximately 1/4 size, as is this example. As a child, it was an exciting day when we heard from our kinfolks who were overseas. I can only imagine how exciting it was when they got their V-mail from home. Merry Christmas, 62 years later. J.E.A. The Old Jail. As I write this on Nov. 27, 2006, the Old Jail has been moved approximately two months ago. It sits on a new foundation, approximately a hundred yards from its original site and two feet higher than before it was moved. We still do not have any routine access to it. No steps other than a ladder, no electricity, heat phone or computer links. We have been able to offer little or no service to our members and visitors for well over two months. Still to be completed are stairs, handicap access, and all utility connections and repairs. Let's hope that the Surry County Administration and Board of Supervisors will move quickly to complete this project. With 2007 coming upon us at a rapid rate, and little more than six months remaining before the replica ship arrives at Claremont, we are already far behind schedule. While we are working hard to make our new facility a fact, we need access to our present offices and our files. Surry County, please help us NOW. During a recent visit to Surry County, daughters of Mr. Goodrich, Pamela Goodrich Palmore of Richmond and Cindy Goodrich Allred, of Littleton, Colorado, were presented a framed copy of a resolution honoring their father. Presented on behalf of the Surry County Historical Society by Past Society President, Bo Bohannon, the resolution expressed the Society's "heartfelt gratitude and abiding appreciation for" Mr. Goodrich's "generosity and for his devotion and outstanding contributions to Surry County." The Blanford Papers, consisting of letters from William P. Underwood, clerk of Court of Surry County, Va. And members of his family have been given the Society by their descendants and Society members George and Nancy Blanford. It is a wonderful collection of letters, largely from William P. Underwood to his daughter Anna Matilda who married Dr J. W. Sessions of Bertie County, N. C. In 1855. There will be much information on this collection later. As the end of 2006 is approaching, we need your HELP! The fund-raising campaign is pleased to announce that we have raised approximately $95,000 in donations and pledges. We have a $100,000 challenge gift which needs to be matched by Dec. 15, 2006. We need $30,000 in additional gifts to reach this challenge. Please help us grow into our new building in 2007. The Future Home of The Surry County, Virginia Historical Society And Museums, Inc. I was born in 1941 on Chestnut Farm in the same room that my father, Joseph Shepherd Berryman, had been born in 1904. Chestnut Farm is located on Alliance Road (Route 634) next door and upriver of Cbippokes Plantation State Park. Today the neighborhood bears little resemblance of what I remember as a child. Perhaps someone reading my memories will be inspired to jot down their own so future generations will have a record of the past. When one rides along Alliance Road from its beginning at Colonial Trail East (route 10) to its end at Chippokes Farm Road (route 633) there is little evidence of the businesses that once thrived on this country byway. At the T intersection of our road and Route 10 was Johnson's Store. This building was actually on Route 10 but faced directly down Alliance Road. It was a small white frame building constructed by Albert S. Johnson about 1940. When World War II began in 1941, Mr. Johnson went to work for Virginia Engineers at the Norfolk Naval Base leaving his wife, Marjorie Kincaid Johnson, to run the store, selling groceries and gasoline. Stopping there was a real treat for me as I was usually allowed to have a 5 cent soft drink from the icy cold water of the drink box. Cokes sold for 6 cents so we didn't get them as often, after all that extra money could be better spent on a piece of penny candy. Sometimes I would choose the biggest soda, a Royal Crown (RC) Cola or a Nehi that could be had in grape or orange flavor, but the very best was the smallest, a Tiny Grapette, that was only 6 ounces. A Tiny was "soooo good" that I still remember the taste and I keep an empty Tiny bottle in my kitchen window sill just for sentimental reasons. This treat disappeared from the market by 1960, maybe earlier. Mr. Johnson had a black and white dog similar to a Border Collie that drank Cokes and some people would buy the dog a drink when they stopped to visit the store. Stopping by just to visit was commonplace, trading local gossip and news of the day, and enjoying the camaraderie of neighbors getting together. I remember Mr. Johnson slicing thick wedges of cheese from what looked to me, a young child, a huge wheel of very sharp cheddar. I don't remember when this store closed but it must have been by 1970. Other ventures tried to operate here, but never for very long and the building was eventually demolished. Across the road from Johnson's on the northwest corner of Route 10 and Alliance Road was Hargraves's Store, a two story structure that stood vacant for many years after it closed, probably about the time Mr. Johnson built his new store in 1940. He had been the last proprietor of Hargrave's which was built and run by W. W. Hargrave. We know from the 1910 Cobham Wharf shipping records that Mr. Hargrave had a booming business and in addition to running a general merchandise store, he bought farm produce and shipped it to Richmond, Norfolk, Petersburg, and even Baltimore via the steamboats calling at the wharf. This business was later run by Hubert and Melville Savedge and then Albert Johnson. I remember the building well, shuttered and surrounded by trees and brush. I think it was torn down in the early 1960s. Just to the west of Hargrave's Store was Ida B. Bennett's small service station and what would be called a convenience store today. This business was started by George Bennett and at his death Mrs. Bennett ran it, supporting herself and son, William. This small building, probably no more than 20 x 30 feet, had a counter across the back. It was dim inside and the original oil lamps on brackets were still in the walls, but in my day the lighting came from a single bulb hanging from the center of the ceiling. Although Mrs. Bennett's was actually on Route 10, it was very near to the Alliance Road intersection and I mention it because it was so much a part of the community. Next, traveling north on Alliance Road at the Y intersection of Cobham Wharf Road (Route 637) was Captain George A. Savedge's Store which also housed the Alliance Post Office. Because of the post office this area has been known as Alliance for a very long time and thus the name Alliance Road. The store was a large two story one and from the 1910 Cobham Wharf shipping records mentioned earlier, it must have been quite a business. As with Hargrave's Store, crops and other farm produce were purchased or traded with local farmers, resold and shipped to the cities of Hampton Roads, Richmond, and Baltimore. Peanuts frequently went up the James River to the Appomattox and on to the processing plants in Petersburg. Alliance Post Office must have closed in 1917 as I have mail addressed there in that year with Alliance crossed out and Surry penciled in. Savedge's Store was by far the largest on the road and stood in the point of land formed by the two roads and there was a small road or path behind the store that connected Alliance and Cobham Wharf Roads forming a triangle. I've been told by Mrs. Joe Scott, who grew up at Alliance that on this road behind the store was a grist mill, a warehouse and a blacksmith shop. Also, the Assembly of God Church founded by the Rev. Horace Jones was housed in Savedge's Store sometime about 1945 and held services there until the congregation was able to build their church in the town of Surry. The store and last standing building in the triangle was torn down in the early 1980s and some of the lumber and doors were used in the refurbishing of the home of Charles and Mary Alma Savedge, a house originally built by Captain Savedge. Directly across Alliance Road from Captain Savedge's was Captain John Gray's Store, known as Bob Omans' Store in my day. The building was a typical country store in appearance complete with a covered porch across the front and I don't know if the second floor had living quarters or was used for storage. I believe the title of Captain was bestowed on Mr. Gray because of his service in the Surry Militia. Following his death the store was run by Bob Omans who had worked for the Grays for many years. I think it must have closed in the 1940s as I only remember being in it once. I do recall a fat tabby cat asleep on a sack of chicken feed. He must have been the store mouser and judging from his girth he was successful at his job. One story I've been told is that Mr. Omans sold chickens that he bought or took in trade and kept them in a coop behind the store. The local young men would sneak around back, steal a chicken, and go around front and sell it to Mr. Omans again, so I guess the chicken business was not too profitable for the old gentleman. About a quarter of a mile down the road is the only store building remaining on Alliance Road. This was run by James Hancock Holt until his death in 1933. The store may have been operated by his widow, Dena Barham Holt, and their children for a while after his death but soon closed as the children grew up and moved away to pursue other interests. Several bills of sale from this store have been framed and given to the Historical Society. One feature of the building is a wonderful chimney and it would be great if we could stabilize and eventually restore this old structure. Mary Beth Bailey told me that when she went home from chuch with her cousin, Bettie Bell Berryman, Bettie's parents would stop at Holt's Store and buy a bag of candy for the girls to share. Bettie would bite each piece to see if she liked the flavor and pass the rejects on to Mary Beth, so she never got a piece of candy without a little bit missing. My father told the story that Mr. Holt always said he wanted to be buried in his overcoat if he died in winter and in his shirt sleeves if he died in summer. I don't know if his wishes were granted or not but I do hope so. Continuing north on Alliance we come to the only African American owned business, William S. Winfield's Barbershop. Mr. Winfield was an accomplished man, a barber, farmer, master carpenter, and a World War I veteran. When building a house for my aunt, Ida Berryman Wheeler, in the late 1940s, I was constantly underfoot and must have been an aggravation for him, but he never let me know it and always entertained me while he worked, giving me pieces of wood to play with. He remains a cherished memory. In his shop he cut the hair of both black and white men and I had a cousin who after moving away, first to college and later to work, always got Willie to cut his hair when visiting Surry. The barber shop still stands complete with barber chair and although slightly askew should be preserved. The third farm past Winfield's Barbershop is called Calverse and was the site of a store operated by Mr. Richard Scott. I'm told that the first store, located near the road, burned and the second, which I remember, was about the distance of a city block from the road near the house occupied by the Scotts. A good size single story frame building, it had counters on three sides with goods on shelves behind them. The back half of the building was a warehouse that could be accessed from the store proper or from an outside porch on the side where there were large hanging sliding doors. Inside you gave Mr. Scott your order and he got the items from the shelves and tallied up your bill. Outside near the front door was a two foot tall Nehi orange drink sign that was a thermometer and for some reason it fascinated me and I've never forgotten it. Mr. Scott would let me reach in the big glass jar of butter cookies and get as many as I could hold in my hand for a penny or two. I really thought I was getting a lot, but my hand was small and I now know it wasn't all that many cookies! His wife, Emily Barham Scott kept her treadle sewing machine near a window where the light was good and if needed would put her sewing aside to wait on customers. This business closed prior to 1950 and the building was taken down sometime in the 1980s. At the end of Alliance Road where it forms a T intersection with Chippokes Farm Road (Route 633) is the site of Barham's Store. This was a two story building that was in ruins when I was and the area is still called Highgate by the old timers. I do not know when the post office closed but I a child and was finally torn down, probably in the 1960s. This store housed the Highgate Post Office have mail postmarked there in 1913. I'm sorry I know nothing of the Barhams who ran this business but there is one legend I can relate. It seems the store had a bar room and in the great freeze of 1918 they ran out of whiskey. Word came that a boat carrying whiskey was frozen in at Hog Island Point and a mule and cart was dispatched across the ice to see if a deal could be made. Alas, when the bounty was finally delivered back it was so cold the whiskey was frozen solid, but the locals were not to be denied, so Mr. Barham cut it up in blocks and sold it by the pound. A Brief History of the Surry County, Va. Circuit Court. October, 1646: By act of the General Assembly, the colonial government of Virginia authorized courts to be established south of the James River in James City County. It was to be held the 16' of every other month. For six years before Surry County was formed, Court was held somewhere in Surry, most likely Southwarke Church. Records of this court are lost, likely burned with the rest of the James City County records. 1652: Surry County was formed and county court began. The first courthouse was established at Wareneck or Southwarke, near Underwood's Mill. 1707-1710: A new courthouse was built at Wareneck. Francis Clements was paid 20,000 pounds of tobacco to build the courthouse in November 1707 and another 20,000 pounds was paid to Nathaniel Harrison to complete the courthouse in 1710. 1728: Surry County's courthouse was moved to Howell Edmond's land near Shingleton Plantation. The site was south of the Blackwater River near present day Route 40 in Sussex County. It was near the center of our population. 1754: Sussex County was split from Surry, so the courthouse was moved back closer to the James River. A wooden building to house the court was built on the land of William Clinch, called "Troopers." 1765: The courthouse at "Troopers" burned and a new brick courthouse was built at the same site. 1787: The brick courthouse at "Troopers" burned. The records are silent on where court was held following this fire until April 15, 1797 when records show that it met in the new courthouse at Macintosh's Crossroads, now the town of Surry. This was a one-story brick courthouse, facing west, built on land given to the county by Robert Macintosh who owned the Ordinary and served as contractor of the new courthouse. 1825-1826: The brick clerk's office across the lawn from the courthouse was built by John Hopkins for the low bid of $979, which was accepted by the county in 1826. For the first time in its 174-year history, Surry County had a permanent home for its records. Prior to that time, the Clerk of Court kept the records, likely at his home. 1864-1865: By 1864 Union Army troops roamed freely through Surry County, so the Clerk of Court moved and hid our court records. The courthouse was abandoned until the Civil War was over. However, court continued to be held. Beginning August 2, 1864, court was held at the Parish House. By March 28, 1865, court was moved to Moore's Swamp Meeting House. By September 25, 1865, after the war, court was being held at the courthouse again. Our records were saved, as proved in an 1869 inventory written into our court records. 1895: With the growth of Dendron and Claremont, the 1797 courthouse was insufficient to handle the county's business and the old building was torn down and a new Victorian courthouse was built to replace it. It featured the first fireproof vault to hold the county's valuable records. 1906: The Victorian courthouse burned but the records were saved. A new classical two-story building replaced the former structure in 1907. It was similar to the present courthouse building, but included a large cupola on the roof. 1922: Another fire destroyed the 1907 courthouse, but again the records were saved. It was replaced with a similar structure which continues in use today. There have been at least nine Courthouses in Surry County. At least four burned. Yet, that and the effects of both the Revolutionary and Civil war, never caused known records of Surry County to be lost or leave the county. After the Civil War, an inventory confirmed none were lost. 2006: Our elected Clerk of the Circuit Court, Gail Clayton, is adamantly against moving our records out of Surry County next year. Can you imagine her having to go to Richmond to get evidence for Court Cases? Will our records be available for evidence, law suits and research? The operation of our courts and availability of records cannot be delayed for the two + years necessary for construction. It's not necessary. There are a number of ways this can be handled. You can build the new archives first, move the records in and then remodel the current archives. It is just a matter of scheduling. Rental space is available. There is the Academy, and the Old Jail after we move to our new building hopefully in 2007. The timing should work. If our records go to Richmond, will we have any assurance that they (every single sheet) will come back to Surry County and when? Will there be any written contract or Judges decree that ensures this? There are those in the State Library who believe they are or should be the repository of old County Records. Many loose papers and records that I have seen that were sent by other counties were only warehoused, unindexed over decades. Some I have seen, with the old original ribbons wrapped around them still had dead silverfish in their original boxes. If they are unindexed when shipped to Richmond, how will we know what they got from the County? There are no second copies of most loose papers. Most counties loose papers sent to Richmond are not stored in the Library of Virginia on Broad Street in Richmond, but in a State warehouse close to the Richmond International Airport. You have to order them well ahead of time to have them located and transported to the Library for viewing. A nearby county had to get a court order to get some of their records back. The Library of Virginia does an excellent job in many, many ways. Let's let them do the job they were established to do. We cannot allow this move to happen. For 354 years we have kept our records safe and available in Surry County. Those counties that sent their records to Richmond in the Civil War saw them burned and lost. Keep our records in our possession. It is a matter of pride and practicality. It can be done. It should be done, it must be done. This is the strong opinion of James E. Atkins. The Surry County, Virginia Historical Society & Museums, Inc.
New 2007 item for sale. The Society is pleased to present and offer to our members a pin/pendant featuring one of the ships that came to Jamestown in 1607. In gold tone, it is close to the size in the photo. Beautifully done, it denotes the visit of the ship scheduled to be in Claremont, Surry County, on May 5, 2007. $26.25 each, plus $1.25 shipping. Order with books below. You will love it! The Society has added two new reprints to its inventory of books for sale. The first is a reprint of a magazine article by A. W. Bohannan in 1949 entitled "The Old Town of Cobham". It is about 20 pages and sells for $7.00 plus $1.00 for shipping. The second reprint is the 1963 book by Willis W. Bohannan, Surry County at War 1862-1865. In the decades before writing this book, A. W. Bohannan, his father, visited with many of the "Old Folks" in the county and took copious notes on the Civil War. His son, Willis W. used his valuable records of Surry County in the Civil War to write this book. Most are first-hand notes from those who participated in the war. It sells for $15.00 plus $1.00 for shipping. We have many Surry BOOKS for sale. Most of them cannot be gotten anywhere else! 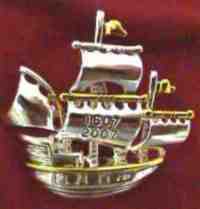 We also have the beautiful Surry Courthouse medallian and the new 1607-2007 ship pin/pendant. Take a look at them and order with the BOOKS! Keep your Dues up to date. Check the renewal date on your Newsletter mailing label. Support your Society!